If you thought the Pretty Party Skewers I just recently launched are only for creating cute party kebabs...think again!! 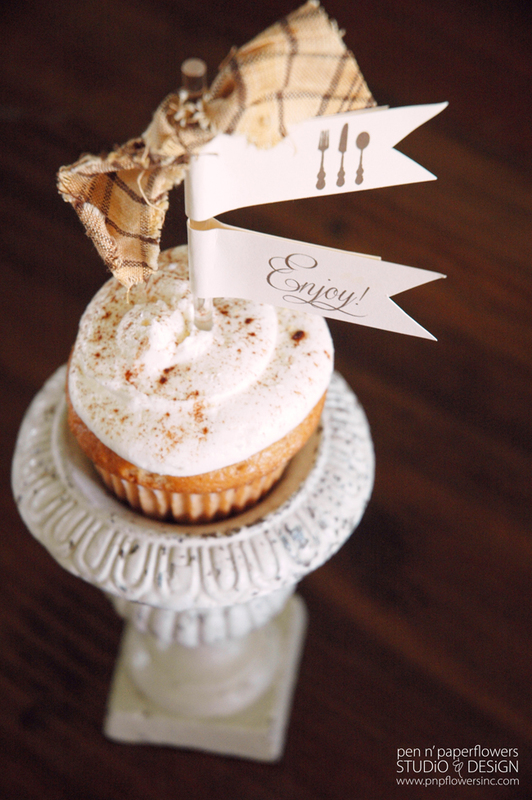 I LOVE how beautiful they look as a CUPCAKE TOPPER on this Snickerdoodle Cupcake! 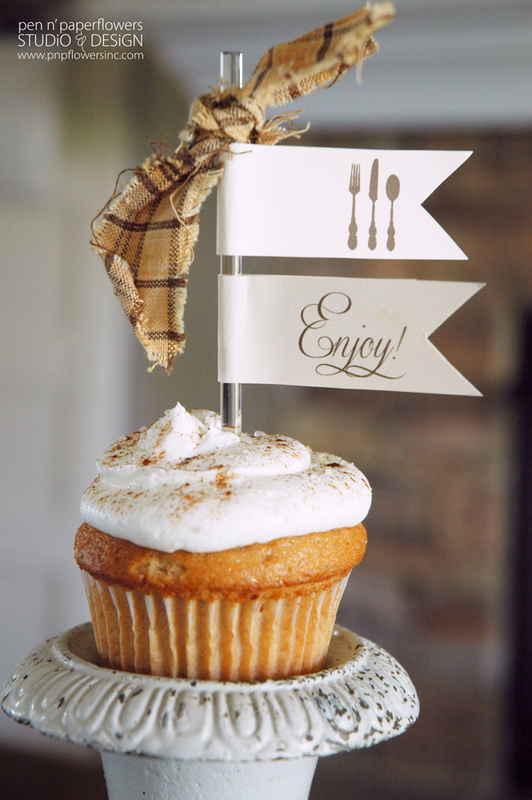 Just tie on a little fabric (or not) and add some cute printable party flags (or just one). Pretty Party Skewers are REUSABLE!! No more throwing away the lollipop sticks you keep buying for cupcake toppers & cake bunting! 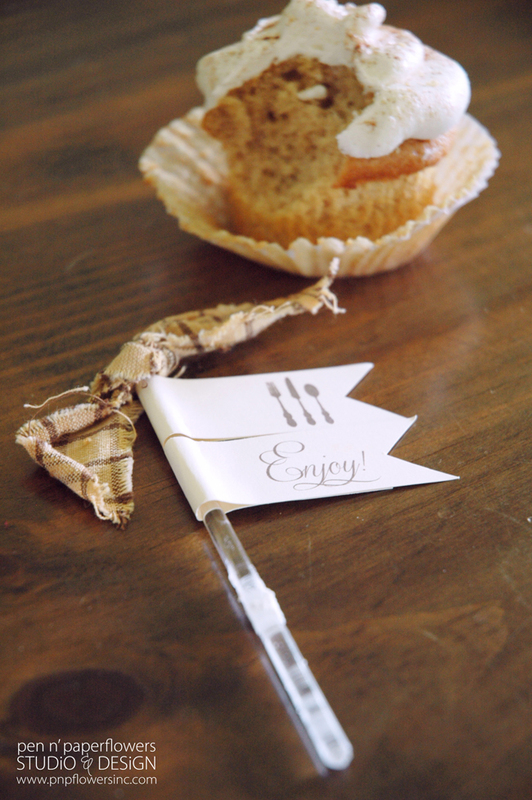 Create place settings too - just add a party flag with the name of your guest!! I hope you love how these turned out!! Can you tell I'm gearing up for Fall with my fabric and color scheme selection!? If you missed it, I was fortunate enough to be published in this month's issue of All You Magazine as one of two of the bloggers selected to participate in this month's craft challenge! but I'm STILL behind and would love it if you would take a minute to vote for me, if you haven't already. Just go to the All You Magazine FB Fan Page. Select the "Pick Your Fave" tab at the top. (It will appear if you have "Liked" the All You Fan Page). Thank You! Thank You! I so appreciate those of you who've already voted! And I'm sending advance thanks to those of you who are heading there right now!! Love your blog. Found you on the Circle of Moms blog and will be back to check out all your great posts. Plan to use the pretty Party Skewers idea for my next party.